These devices are able to provide such a high level of performance at such a low cost (often just 15 cents per day) because of the internal heating elements which turn the bars into sources of radiant heat for warming towels and bathrobes. And not only do these electric devices warm your bath towels, they can actually dry them in-between uses. 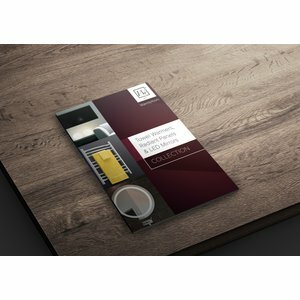 We offer a wide variety of models with different styles, bar-counts, connection types, and finishes to ensure you find the perfect one for your project. Designed as a freestanding unit, giving the ultimate flexibility to use it in virtually any room of your home. With 20 curved bars and a high heat output, the Bellagio is an impressive model. 4 bars with a sleek serpentine loop design to allow towels to slide on and off easily. The flat bars provide ample surface area to heat and dry your towels and bathrobes. Comes with 8 heated bars and a non-heating storage shelf, which also doubles as the top set of mounting brackets for the towel warmer. 6 evenly spaced bars and includes an integrated control with several options. Our most popular model and it`s available in either plug-in or hardwired variations. Beautiful, large model that perfectly blends high-performance functionality with stunning aesthetics. The 8 flat, heated bars provide maximum surface area contact for expedient heating. Features an innovative design with an integrated, non-heating storage shelf for extra towels. 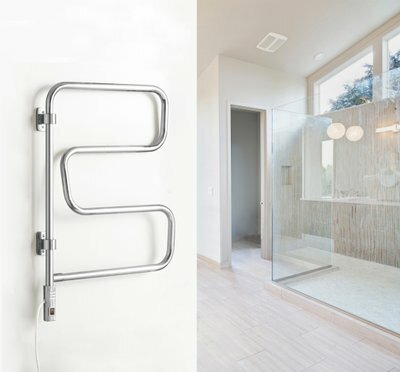 10 sleek heated rails that are perfect for warming large bath towels and bathrobes. The flat bars provide maximum surface area for expedient drying of your towels and bathrobes. The straight, linear design of this model is exemplified by the 11 heated, square bars. The Ontario XL`s unique design makes it perfectly suited for a wide range of towels. This compact plug-in model is a great way to add a towel warmer to any bathroom. Modern design with a curved 3D profile and it can accommodate two large towels. Boldly modern design with an emphasis on high performance. 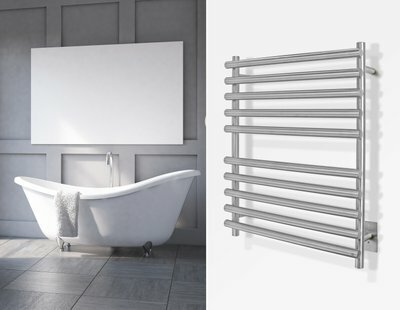 8 sleek horizontal heated rails and can easily dry and warm large bath towels or bathrobes. The tall, slender profile of this model allows for peak performance without taking up unnecessary wall-space. 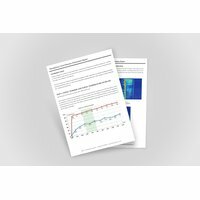 This model combines straight, linear lines with high-level performance. Comes with 6 heated bars and a built-in non-heating storage shelf for towels. With 21 heated bars, this is one of our largest and most powerful models. 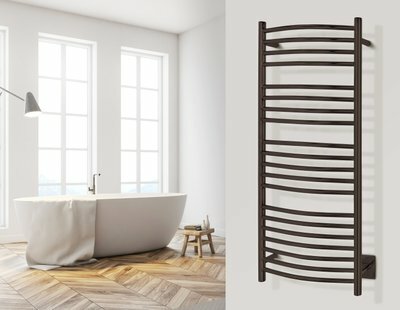 The Barcelona Towel Warmer is designed as a freestanding unit, giving the ultimate flexibility to use it in virtually any room of your home. 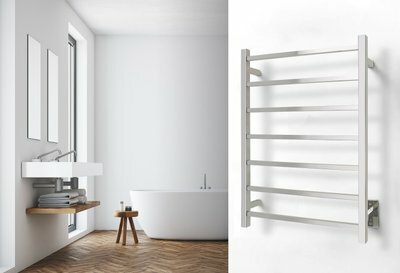 Barcelona Towel Warmers are available in a brushed stainless steel finish. Each Barcelona heated towel rack comes with a 2-year warranty. 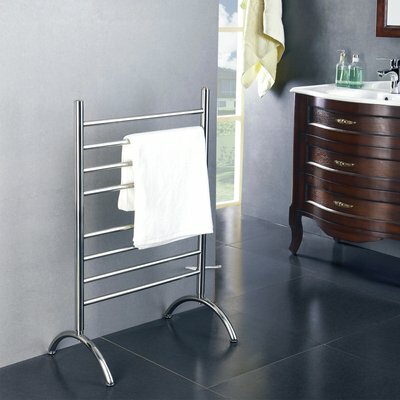 The Bellagio towel warmer from WarmlyYours is an elegant and impressively designed model. With 20 heated, curved bars, it’s no surprise that the Bellagio boasts a high heat output of 648 BTUs per hour. Each Bellagio Towel Warmer comes with a 5-year warranty. 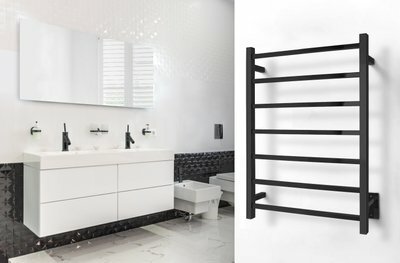 The 4-bar Elements Towel Warmers have a sleek serpentine loop design to allow towels to slide on and off easily. 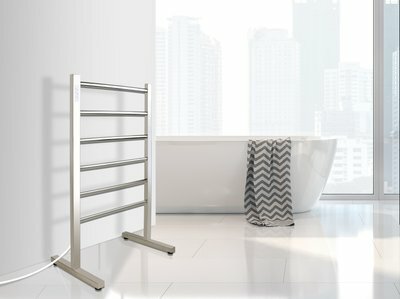 With an elegant, simple design and polished chrome finish, electric heated towel racks are an affordable option for warming and drying your towels. Each Elements Towel Warmer comes with a 2-year warranty. If the Grande towel warmer from WarmlyYours proves anything, it’s that sometimes huge performance comes in small packages. It’s heat output stands toe-to-toe with many larger models, while its compact profile means the Grande can be installed in a variety of locations. The spacing of the bars also incorporates a specialized top-bar pairing for hand towels. Each Grande Towel Warmer comes with a 5-year warranty. The Huron towel warmer features an innovative design and a high level of performance. The 8 heated bars of the Huron will deliver a heat output of 307 BTUs per hour which will not only warm your towels and bathrobes but also heat them between uses. The non-heating storage shelf at the top of the unit is perfect for storing extra towels. Each Huron Towel Warmer comes with a 5-year warranty. The Ibiza towel warmer from WarmlyYours represents the perfect blend of versatility and functionality. 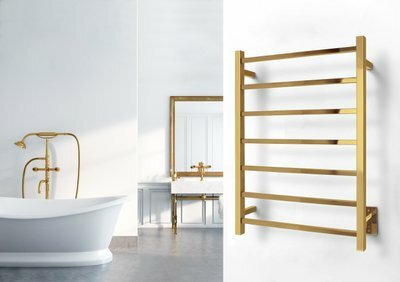 With its freestanding construction and plug-in connection, the DIY-friendly Ibiza, unlike wall-mounted towel warmers, can be used in almost any room with a functioning outlet and easily moved to different locations. Additionally, the integrated control offers several options: manual on/off control, on for 2 hours, and on for 4 hours. Each Ibiza Towel Warmer comes with a 5-year warranty. The Infinity Towel Warmers are available in both plug-in or hardwired models and weigh in at less than 9 pounds. 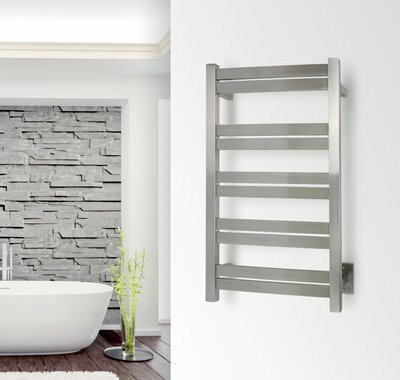 Manufactured from stainless steel with a beautifully brushed finish and 10 sleek heated towel rails to hang bath towels or a bathrobe, this towel warmer will suit families large or small. Each Infinity Towel Warmer comes with a 2-year warranty. With 11 heated, round bars the Malta boasts an impressive heat output of 443 BTUs per hour. This wall-mounted model will be able to warm and/or dry a large variety of towel shapes and sizes. The number of bars, and their orientation in the assembly, means this model will be able to accommodate a large variety of towel shapes and sizes. Each Malta Towel Warmer comes with a 5-year warranty. 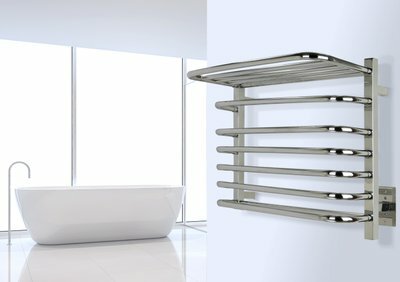 The Maple 8 towel warmer from WarmlyYours is a compact model that provides an enormous amount of functionality. The 8 flat, heated bars of this wall-mounted model help the Maple 8 put out an impressive 358 BTUs per hour. Each Maple 8 Towel Warmer comes with a 5-year warranty. With its compact design, this model delivers all of the functionality of larger units without taking up unnecessary wall-space. The hardwired electrical connection for the wall-mounted Maui will provide a streamlined look without visible wires. The 7 heated bars will deliver a heat output of 222 BTUs per hour. The Maui also comes with a non-heating storage shelf for extra towels. Each Maui Towel Warmer comes with a 5-year warranty. 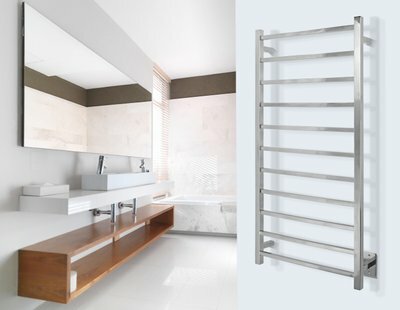 The Metropolitan Towel Warmer has 10 sleek heated rails that are perfect for warming large bath towels and bathrobes. The classic design and large format of the Metropolitan ensure that it will be able to accommodate a huge variety towel shapes and sizes. 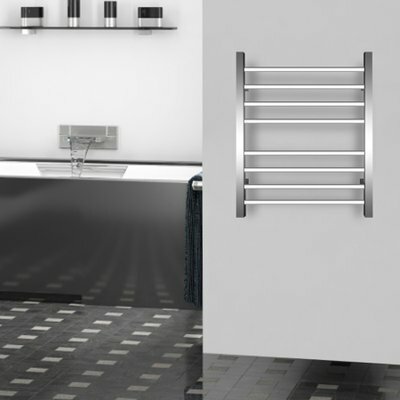 Metropolitan Towel Warmers are available in a polished stainless steel finish. Each Metropolitan Towel Warmer comes with a 2-year warranty. This impressive wall-mounted model boasts one of the highest heat outputs available at 734 BTUs per hour. The Milan 14’s design also incorporates a spacing that allows the top pair of bars to perfectly accommodate hand towels. Each Milan 14 Towel Warmer comes with a 5-year warranty. 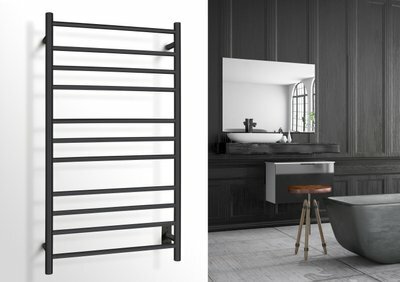 The London towel warmer from WarmlyYours is a large and visually stunning model. With it’s impressive heat output of 409 BTUs per hour, this model will ensure that you’ll be able to warm or dry your towels or bathrobes expediently. 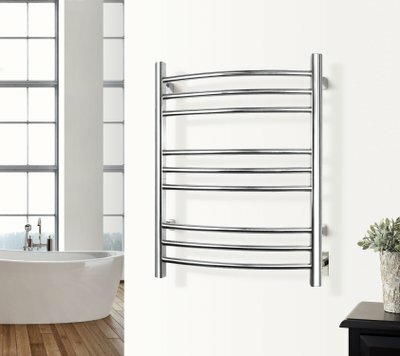 Each London Towel Warmer comes with a 5-year warranty. 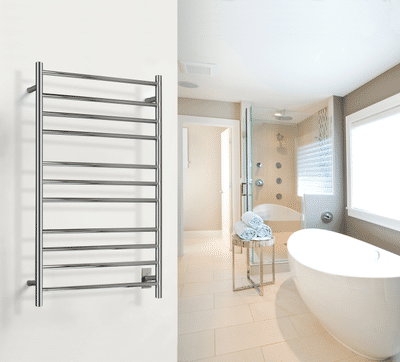 There’s no doubt that a towel warmer delivers comfort and luxury, but the Ontario XL from WarmlyYours is a perfect example of how functional an electric towel warmer can be. The economical Ontario XL’s distinctive size offers two immediate benefits: it can easily accommodate multiple towels and its heat output of 443 BTUs per hour is hard to beat for the price. Each Ontario XL Towel Warmer comes with a 5-year warranty. 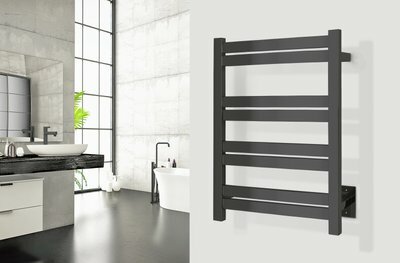 The compact and economical Palma towel warmer from WarmlyYours provides all of the functionality of larger models, while taking up less wall space. 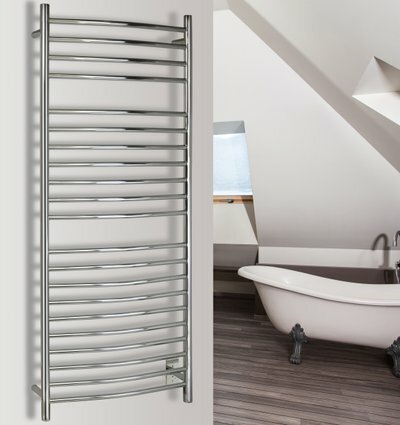 This wall-mounted model, with its plug-in connection, is very DIY-friendly and its 304-stainless steel construction means that the Palma is durable and easy to maintain. The square bars, linear design, and highly polished finish means this unit will be a functional and attractive addition to any room. Each Palma Towel Warmer comes with a 5-year warranty. 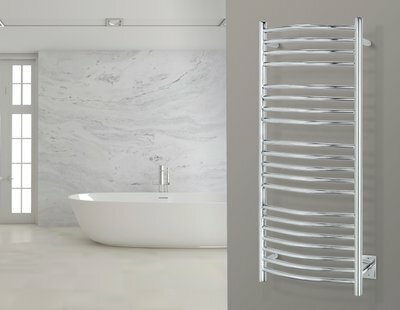 The Riviera Towel Warmers have a modern-looking, curved tubular profile and can accommodate two large towels. Each electric towel rack is manufactured from superior quality stainless steel. 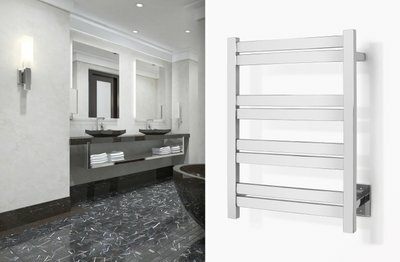 Riviera Towel Warmers are available in both polished and stainless steel finishes. Each Riviera Towel Warmer comes with a 2-year warranty. This wall-mounted model comes with 10 heated bars which help the Rome put out an impressive 426 BTUs per hour. The three-dimensional cross-lay of the round bars ensures the Rome will be able to warm or dry your towels and bathrobes. Each Rome Towel Warmer comes with a 5-year warranty. 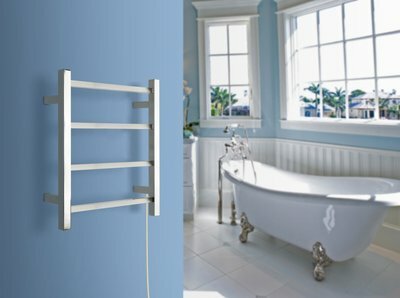 The Sierra Towel Warmer has 8 sleek horizontal heated rails and can easily dry and warm large bath towels or bathrobes. With two sets of four heating bars, the Sierra has ample room for accommodating your favorite bath towel, regardless of size or shape. 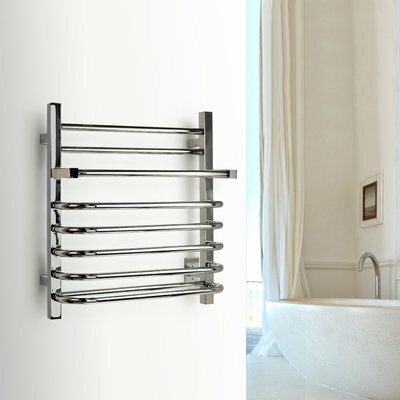 Sierra Towel Warmers are available in a polished stainless steel finish. Each Sierra Towel Warmer comes with a 2-year warranty. 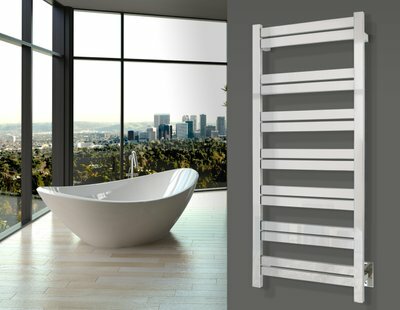 The Sydney towel warmer from WarmlyYours represents a perfect balance of functionality and stunning design. The impressive heat output of 273 BTUs per hour means this model can not only warm your towels and bathrobes but also dry them between uses. Each Sydney Towel Warmer comes with a 5-year warranty. Experience a new level of luxury with the Tahoe towel warmer. 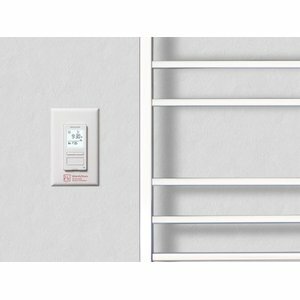 These wall-mounted models come with a discrete power switch and hardwired electrical connection. The straight lines and square bars of the Tahoe are a perfect complement to the linear design aspects of most contemporary bathrooms. The Tahoe is available in either 6-bar or 7-bar variations. Each Tahoe Towel Warmer comes with a 5-year warranty. The Vancouver Towel Warmer is an innovative model with an integrated non-heating shelf for extra towels. The compact design of the Vancouver means this model takes up less wall space than larger units while providing the same level of functionality. The 6 heated curved bars will warm and dry your towels and bathrobes very quickly. Each Vancouver Towel Warmer comes with a 5-year warranty. A towel warmer is more than a simple appliance—it’s a gateway to a level of comfort previously only available in expensive spas. The large number of bars and their orientation ensures you’ll be able to warm and dry a wide range of towels, bathrobes, and more. The Vida also boasts an impressive heat output rate of 716 BTUs per hour. Each Vida Towel Warmer comes with a 5-year warranty. 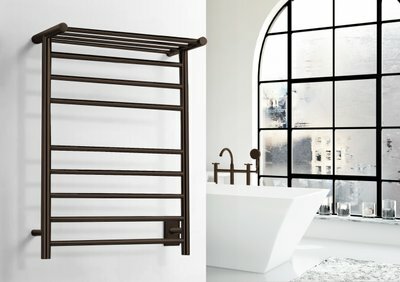 Choosing the right electrical connection for you is a crucial step in identifying the perfect towel warmer. WarmlyYours offers both hardwired (meaning the electrical connection is made at a junction-box inside the wall) and plug-in models (with 3-prong plug). Provides a visually streamlined look without cords or wires. Can be unplugged when not in use. Whether you choose a hardwired or plug-in model, WarmlyYours offers a wide array of controls to help you get the most out of your towel warmer. Depending on the control you select, you can program the towel warmer to your schedule or operate it remotely. 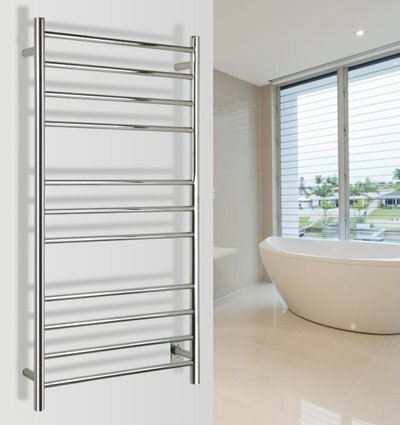 After you've decided on an electrical connection, the next question is whether or not you want your towel warmer to be mounted on the wall or floor-standing. Both types of towel warmers are easy to install but our 24/7 Tech Support will always be there to answer any questions that come up. 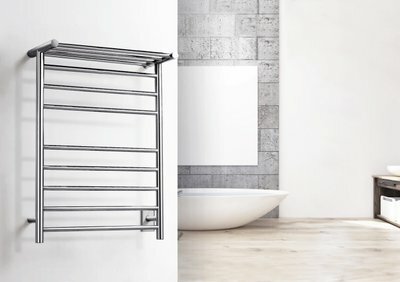 The majority of towel warmers will be wall-mounted, which means they take up less space overall and it will make electrical connections easier (all hardwired towel warmers are wall-mounted). However, free-standing models are a really good choice for small spaces as they can be moved when not in use. 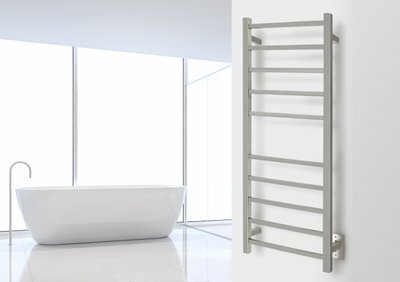 Professionally crafted and designed to fit any budget, our range of Electric Heated Towel Warmers are a key addition to any bathroom and operate at a fraction of the cost of many liquid filled models. 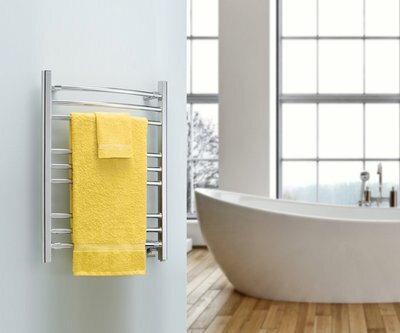 Made with superior hand-finished quality metals, each stainless steel towel warmer includes hidden wiring mounts for single stud installation. Whether you choose hardwired or plug-in, installation is a breeze. Quick warm up time with evenly distributed heat for optimal warmth. 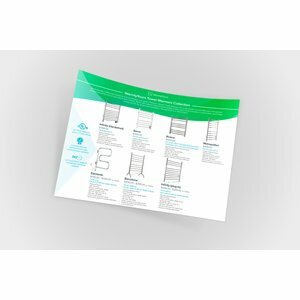 cULus Listed and meets all electrical code standards in our industry. I provided a programmable timer for the receptacle in which the towel warmers are plugged. I highly recommend this product. Our towels are warm every morning and dry shortly after our showers. Even in the steamy summer months. WarmlyYours still believes in customer care! Loving our towel warmer! Working with our contractor to figure out viability of getting electricity to two other bathroom locations for additional ones in the home. But, our experience goes beyond product itself. Customer service is truly old school, and hard to find such customer oriented companies these days. So happy WarmlyYours still believes in customer care! Thanks for a great product, and great service!